I had a farewell lunch with coworkers at a Thai restaurant near work in Downtown Mountain View. This restaurant was chosen because Amarin has a separate menu for vegetarians and vegans. Each diner was given three menus- vegetarian/vegan, lunch special, and standard menus. That was a lot of reading and took some coworkers a bit of time deciding which to order. I noticed that the pad Thai with chicken or shrimp was on the lunch menu, pad Thai with tofu was on the vegetarian/vegan menu, and the crab pad Thai on the standard menu.. It’d be so much better if there was only one menu given to reduce clutter and confusion. Most Thai places here use chicken breast for chicken pad Thai, which is healthier but on the drier side. I also didn’t want shrimp or tofu, so I went with crab pad Thai. The crab pad Thai had crab meat, red onions, green onions, mung bean sprouts, egg, and rice noodles. 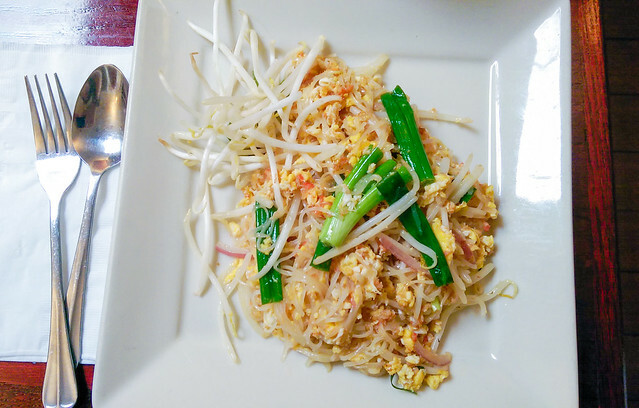 Pad Thai or phat Thai (Thai: ผัดไทย, RTGS: Phat Thai) is a stir-fried rice noodle dish commonly served as a street food and at casual local eateries in Thailand. 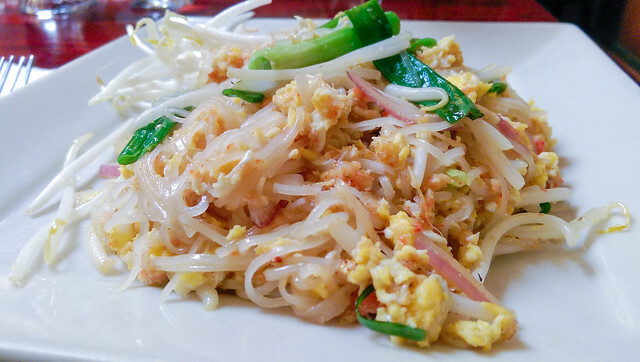 It is made with soaked dried rice noodles, which are stir-fried with eggs and chopped firm tofu, and flavored with tamarind pulp, fish sauce (Thai: Nam pla น้ำปลา), dried shrimp, garlic or shallots, red chili pepper and palm sugar, and served with lime wedges and often chopped roast peanuts. It may also contain other vegetables like bean sprouts, garlic chives, coriander leaves, pickled radishes or turnips (Thai: Hua Chai Po หัวไชโป๊), and raw banana flowers. It may also contain fresh shrimp, crab, chicken or another protein. Vegetarian versions may substitute soy sauce for the fish sauce and omit the shrimp.